I'm often asked how I get my band of busy boys to sit for extended periods of living-literature style learning. If you have been blessed with many boys, you know that at times getting them to sit still for long amounts of time is kind of like trying to herd cats or lasso jello. Don't get me wrong, I looooove the fact that my boys ARE boys. But sometimes, I have to get a little creative during the school day in order to wrangle all the energy, so that learning can actually take place. I schedule our living literature readings during snack time. Not to toot my own horn, but it's PURE GENIUS! I wait until the mid-day munchies set in, sit them all down at the table (Ok...if you have boys, you know that I use the term "sit" rather loosely. ), and push a plate towards them. They eat...completely sedate while I read. Their energy is pointed in a constructive direction allowing me plenty of time to read a chapter of a great living history or science book. And just WHAT do I put on their plates? While it's certainly easier to reach for a box of graham crackers, I TRY to weave in a few of these family favorites too. 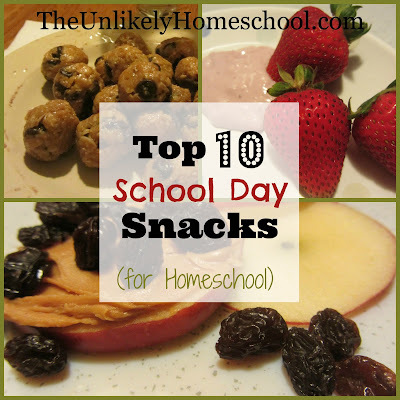 Here's a quick run down of some of our Top 10 school day snacks. Directions: Combine all ingredients in a large bowl. Mix well. Chill until the mixture is firm enough to roll. Roll mixture into 1 inch balls. Enjoy! I like to let the balls sit in the fridge for an hour or so to let the flavors meld together before I serve them. But, to be honest, I usually have a line of "taste testers" forming WHILE I'm rolling them into balls. My in-laws have access to an abandoned apple orchard and over the years have kept us stocked with organic apples for freezing, baking, and snacking. While I make our favorite homemade sauce over the stove, (I'll share the recipe with ya' sometime soon. ), I've also made a time-friendly version featured at Eat at Home Cooks that we enjoy almost as much. This simple twist on apples and peanut butter is a hit with everyone but my "I don't like raisins" boy. Core an apple, cut it into horizontal slices, smear on a generous layer of peanut butter, and sprinkle with raisins. Sometimes I top the "wich" with another slice of apple and sometimes I leave it "open faced." ...otherwise you stand a very good chance of poking your eye out from the sheer velocity of flying granola when you try to hammer it out with a knife. TRUE. STORY. Although you could top any juicy fruit with homemade granola, we prefer peaches. I just toss a few slices into a bowl, sprinkle some granola on top, and serve with a spoon. Snacks are always more fun with dip! I have a great fruit dip recipe, but it has many ingredients in it making it super expensive and labor intensive. 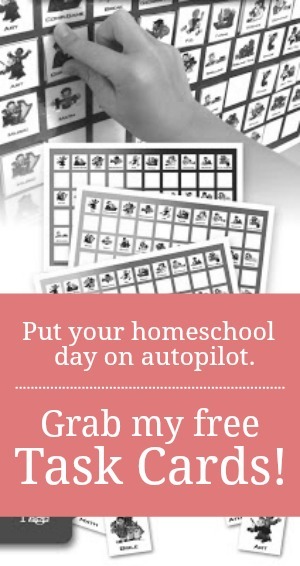 On school days, I take the cheap and easy route and serve up a spoonful of yogurt. Although I sometimes opt for store bought, I prefer the homemade variety with berry syrup from 100 Days of Real Food that I mix into it to give it that "Yoplait" flavor. I've only recently discovered Snack Factory Pretzel Crisps. (I buy them at Costco. But, I've also seen them in smaller bags at Walmart and my local grocery store.) They make for a perfect cracker alternative since they are wide and flat and what's more, have REAL ingredients on the label! I top them with all kinds of things...sliced meat, cheese, peanut butter...and serve them like little finger sandwiches at snack time. So, that's what we like to munch on. How about you? What snacks do you serve up on a school day? Tina, I think you are such an amazing mom! I honestly don't know how you do it with so many allergies to account for. And since I've dined at your house before, I know that you feed them all well! Thanks for your encouraging words. My oldest boy can happily sit and read for hours. My younger boy can finally sit, but would rather lay on the floor playing cars. My daughter is the youngest and maybe that's why, but she can NOT sit still for two seconds together! She has moved nonstop since the womb. Some days, I just get tired watching her. But she's a joy in all that motion. I'm a new reader--found you on YouTube oddly enough since I am hardly ever on there--and I am enjoying your posts so very much! I've been meaning to try applewiches.